Solar power can deliver both electricity and hot water to homes by utilising the heat and light of the sun. Once the appropriate systems are installed the home’s harmful carbon dioxide emissions will be reduced and energy bills cut. A photovoltaic system is required to generate solar electricity and can be installed on a roof or wall that faces within 90 degrees of south and is not overshadowed by trees or buildings. The system uses cells made up of layers of a semi-conducting material – usually silicon - and when light reaches the cells it creates an electric field and electricity is generated. As a photovoltaic system requires only daylight to produce electricity some power can be generated on a cloudy day but the more intense the sunlight the greater the flow of electricity and if cells are in shadow for some of the day the output will decrease. The size of the system will depend on the amount of electricity required and the cost of cells can vary depending on their kilowatt peak which is the amount of energy they generate in full sunlight. Solar panels that sit on the roof cost less than integrated roof panels and solar tiles are more expensive still. The type of building the system is installed on can also alter the price and with so many variables a domestic system can cost anything between £7500 and £24000 to provide annual savings on electricity bills of up to £200. Photovoltaic systems do not produce greenhouse gases and in the course of its lifetime a system can reduce carbon dioxide emissions by 11 tonnes. If the system is connected to the grid little maintenance is required other than having wiring checked and panels kept clean although stand-alone systems will need batteries and other components checked. 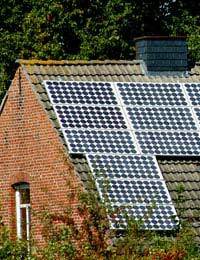 Some local authorities require planning permission for photovoltaic systems and the roof or wall must be strong enough to hold the not inconsiderable weight of solar panels which come in various designs to allow them to blend in easily with roof tiles or conservatory glass. Rather than harvesting light, solar water heating systems utilise the heat of the sun to provide 40 to 70 % of the home’s hot water needs. There are two main types of solar panel used - flat plate collectors and evacuated tube collectors. Evacuated tubes are typically more effective in terms of surface area but are also typically more expensive to buy. Therefore, in practice, both flat plate and evacuated tubes provide plenty of hot water. Both types can be fitted to a roof that faces from east via south to west that receives sun and daylight for most of the day. An east or west facing collector needs to have 25% more surface area as compared to a south facing collector (e.g. 4 m2 facing south = 5 m2 facing east or west). The collected heat is used to warm water that is then stored in a hot water cylinder until needed. Government grants of up to £2,500 per UK household are available for both solar electricity and solar water heating systems through the Department for Business Enterprise and Regulatory Reform’s Low Carbon Buildings Programme. Grants can contribute to the cost of installing a certified product by a certified installer. An alternative grant for solar water heating is available in Scotland through the Scottish Community Householder Renewables Initiative, funded by the Scottish Executive. It can provide up to 30 per cent of the installation cost up to a maximum of £4,000, while in Northern Ireland the Environment and Renewable Energy Fund offers grants to householders.